Is your rope in need of replacing? 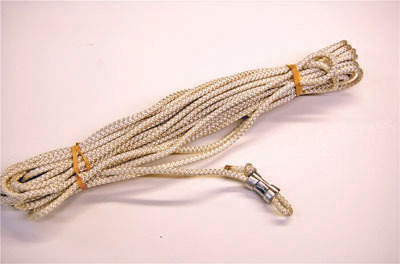 High-quality knit braided polyester rope in either 45-feet or 55-feet lengths. Use 45-feet for 14-foot tall poles. Use 55-feet for 16-foot tall poles. Seeing small tufts on your rope? That is normal wear and tear. Ideally, the rope that came with your gourd rack should last many, many years. Little tufts of "hair" are normal to see on the rope. Believe me, you will know when your rope is failing. I have kept my gourd racks out in the elements here in Pennsylvania for 15 plus years, and I only replaced one rope in all that time. This rope is manufactured in-house at the Troyer's Rope Company, Andy Troyer's parent business. We have used this same rope since the first gourd rack was ever developed.